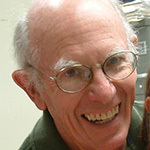 Jerome “Jerry” Dempsey, PhD, was born and raised in Canada. His first career aspiration was to become a professional baseball player; later he modified that plan and pursued an undergraduate degree in biology and physical education at the University of Western Ontario, then taught high school science and coached young athletes. When school was out for the summer one year, he had an opportunity to work in a lab at the University of Alberta. There he found his next calling, and decided he wanted more than just a short-term experience—he wanted to become a scientist. So, in 1963, he went to the University of Wisconsin-Madison to pursue that goal. Today, Dr. Dempsey is the director of research at the John Rankin Laboratory, where he supervises trainees and serves as an instructor in respiratory, exercise, and sleep physiology for medical students, undergraduates and graduate students. His major research emphasis has been on respiration in health and disease, from control to mechanics to respiratory muscles, both while awake and asleep and using humans as well as animal models. Recently, he has also proposed that most humans are poorly equipped for exposure to hypoxia (oxygen deprivation) because most of their key adaptations also have negative consequences. Dr. Dempsey says his most rewarding work is when he is teaching or one-on-one mentoring. The Rankin Laboratory has supervised the training of 68 pre- and post-doctoral fellows since it opened, and the great majority continues to practice their science. One of his past mentees is M. Safwan Badr, MD, MBA, who currently is professor and chief, Pulmonary Critical Care and Sleep Medicine, Department of Internal Medicine, Harper University Hospital, Wayne State University School of Medicine in Detroit, Michigan. Scott Powers, PhD, is a leading researcher in respiratory muscle physiology and a colleague who has known Dr. Dempsey for more than 25 years and is currently a professor in the Department of Applied Physiology and Kinesiology at the University of Florida-Gainsville and director of the Center for Exercise Science. He agrees that Dr. Dempsey has contributed much to his trainees, and to medicine. “Jerry Dempsey is a remarkable scientist with great passion for the study of respiratory biology. Without question, his outstanding research has greatly advanced this field. Importantly, Jerry has also contributed to respiratory physiology by his outstanding teaching and mentoring of the next generation of respiratory biologists,” Dr. Powers says. One of the reasons he has valued his involvement with ATS is because it offered him this opportunity to interact with clinicians. In 1976, he began a 30-year collaboration with the late James B. Skatrud, MD, a pulmonologist. Working together with epidemiologists, they built one of only three centers in the U.S. at that time to study the prevalence, causes, and consequences of sleep apnea. Dr. Dempsey has been a sports enthusiast all his life, and he continues to participate in ice hockey and softball, and work out every day. He also enjoys coaching his granddaughter’s softball team, something he has done for 10 years. He and his wife, Barbara, have been involved as volunteers in the Big Brothers Big Sisters program for 50 years.